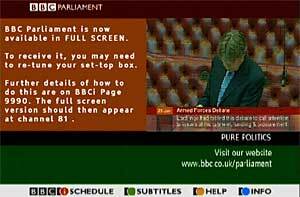 From 13 November, viewers on Freeview (DTT) can watch BBC Parliament in full screen, instead of quarter screen. In order to pick up the new version, receivers will need a rescan. In many cases, this is automatic. 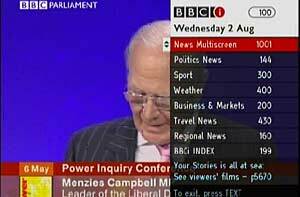 However, if you see a screen similar to the one below when you tune to BBC Parliament, it means your digital TV or set-top box will need a manual retune. Information is also available on page 9990 on BBCi. BBC Parliament remains on Freeview channel 81. You can also watch it online.